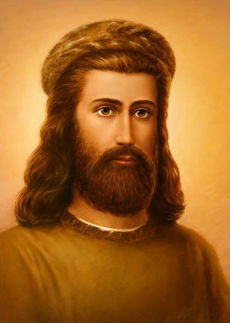 The ascended master Kuthumi, formerly [[chohan]] of the [[second ray]] of wisdom, now serves with [[Jesus]] in the office of [[World Teacher]]. This much beloved master is hierarch of the Temple of Illumination in Kashmir, which is also known as the [[Cathedral of Nature]]. The ascended master Kuthumi, formerly [[chohan]] of the second ray of wisdom, now serves with [[Jesus]] in the office of [[World Teacher]]. He is the head master of the [[Brothers of the Golden Robe]] and trains students who are on the ray of wisdom in the art of meditation and the science of the Word in order that they may become master psychologists of their own psyche, or soul. As Pharaoh Thutmose III (c. 1567 <small>B.C</small>. ), greatest of pharaohs, prophet and high priest, patron of the arts, he is considered the architect of the Egyptian empire. He expanded the Egyptian kingdom to include most of the Middle East. His most decisive victory was on the battlefield near Mt. Carmel. There he led the entire army single file through narrow Megiddo Pass to surprise and defeat an alliance of 330 rebellious Asian princes—a daring maneuver protested by the pharaoh’s terrified officers. Thutmose alone was assured of his plan and rode ahead holding aloft the image of Amon-Ra, the Sun God who had promised him the victory. As Pharaoh Thutmose III (c. 1567 <small>B</small>.<small>C</small>. ), greatest of pharaohs, prophet and high priest, patron of the arts, he is considered the architect of the Egyptian empire. He expanded the Egyptian kingdom to include most of the Middle East. His most decisive victory was on the battlefield near Mt. Carmel. There he led the entire army single file through narrow Megiddo Pass to surprise and defeat an alliance of 330 rebellious Asian princes—a daring maneuver protested by the pharaoh’s terrified officers. Thutmose alone was assured of his plan and rode ahead holding aloft the image of Amon-Ra, the Sun God who had promised him the victory. In the sixth century <small>B.C</small>., he was the Greek philosopher Pythagoras, the “fair-haired Samian” who was regarded as the son of Apollo. As a youth, Pythagoras conferred freely with priests and scholars, eagerly seeking scientific proof of the inner law revealed to him in meditation upon Demeter, the Mother of the Earth. His quest for the great synthesis of truth led him to Palestine, Arabia, India, and finally to the temples of Egypt, where he won the confidence of the priests of Memphis and was gradually accepted into the mysteries of Isis at Thebes. In the sixth century <small>B</small>.<small>C</small>., he was the Greek philosopher Pythagoras, the “fair-haired Samian” who was regarded as the son of Apollo. 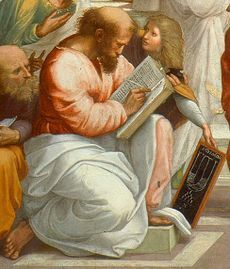 As a youth, Pythagoras conferred freely with priests and scholars, eagerly seeking scientific proof of the inner law revealed to him in meditation upon Demeter, the Mother of the Earth. His quest for the great synthesis of truth led him to Palestine, Arabia, India, and finally to the temples of Egypt, where he won the confidence of the priests of Memphis and was gradually accepted into the mysteries of [[Isis]] at Thebes. When Asian conqueror Cambyses launched a savage invasion of Egypt about 529 <small>B.C</small>., Pythagoras was exiled to Babylon, where the prophet Daniel still served as king’s minister. Here rabbis revealed to him the inner teachings of the I AM THAT I AM given to Moses. Zoroastrian magi tutored him in music, astronomy and the sacred science of invocation. After twelve years, Pythagoras left Babylon and founded a brotherhood of initiates at Crotona, a busy Dorian seaport in southern Italy. His “city of the elect” was a mystery school of the Great White Brotherhood. When Asian conqueror Cambyses launched a savage invasion of Egypt about 529 <small>B</small>.<small>C</small>., Pythagoras was exiled to Babylon, where the prophet Daniel still served as king’s minister. Here rabbis revealed to him the inner teachings of the I AM THAT I AM given to [[Moses]]. Zoroastrian magi tutored him in music, astronomy and the sacred science of invocation. After twelve years, Pythagoras left Babylon and founded a brotherhood of initiates at Crotona, a busy Dorian seaport in southern Italy. His “city of the elect” was a [[mystery school]] of the Great White Brotherhood. In his final embodiment, the adept Kuthumi (known also as Koot Hoomi and K.H.) led a secluded life, affording but a fragmented record of his words and works. Born in the early nineteenth century, Mahatma Kuthumi was a Punjabi whose family had settled in Kashmir. He attended Oxford University in 1850 and is believed to have contributed “The Dream of Ravan” to ''The Dublin University Magazine'' around 1854, prior to returning to his homeland. In his final embodiment, the adept Kuthumi was revered as a Kashmiri brahman, Koot Hoomi Lal Singh (also known also as Koot Hoomi and K.H.) Koot Hoomi led an extremely secluded life, affording but a fragmented record of his words and works. Born in the early nineteenth century, Mahatma Kuthumi was a Punjabi whose family had settled in Kashmir. He attended Oxford University in 1850 and is believed to have contributed “The Dream of Ravan” to ''The Dublin University Magazine'' around 1854, prior to returning to his homeland. With [[El Morya]], known as the Master M., Kuthumi founded the Theosophical Society in 1875 through [[Helena P. Blavatsky]]. The Theosophical Society has published Kuthumi’s and El Morya’s letters to their students in ''The Mahatma Letters'' and other works. Kuthumi ascended at the end of the nineteenth century. With [[El Morya]], known as the Master M., Kuthumi founded the [[Theosophical Society]] in 1875 through [[Helena P. Blavatsky]], commissioning her to write ''Isis Unveiled'' and ''The Secret Doctrine''. 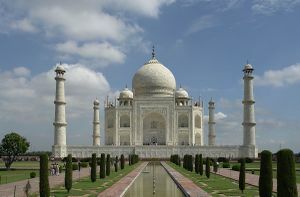 The purpose of this activity was to reacquaint mankind with the wisdom of the ages that underlies all of the world’s religions, the inner teachings guarded in the mystery schools since the last days of Lemuria and Atlantis. This includes the doctrine of reincarnation—which, we note, Saint Francis preached in the village squares—as well as an understanding of the ascension as the goal of life sought knowingly or unknowingly by every son and daughter of God. The Theosophical Society has published Kuthumi’s and El Morya’s letters to their students in ''The Mahatma Letters'' and other works. Kuthumi ascended at the end of the nineteenth century. From the focus of his etheric retreat at Shigatse, Tibet, Kuthumi plays celestial music on his organ to those who are making the transition called “death” from the physical plane to higher octaves. So tremendous is the cosmic radiation that pours through that organ—because it is keyed to the music of the spheres and an organ-focus in the [[City Foursquare]]—that souls are drawn out of the astral plane as if following a pied piper. Kuthumi has given a key to understanding our psychology in his teachings on the [[dweller-on-the-threshold]] and the electronic belt. The momentums of untransmuted karma in orbit around the “nucleus” of the synthetic self (or carnal mind) form what looks like an “[[electronic belt]]” of misqualified energy around the lower portion of man’s physical body. Diagrammed at the point of the solar plexus, extending downward in a negative spiral to below the feet, this conglomerate of human creation forms a dense forcefield resembling the shape of a kettledrum. Referred to as the realm of the subconscious or the unconscious, the electronic belt contains the records of unredeemed karma from all embodiments. At the eye of this vortex of untransmuted energy is the consciousness of the anti-self personified in the dweller-on-the-threshold, which must be slain before one can attain full [[Christhood]]. Diagrammed at the point of the [[Solar-plexus chakra|solar plexus]], extending downward in a negative spiral to below the feet, this conglomerate of human creation forms a dense forcefield resembling the shape of a kettledrum. Referred to as the realm of the subconscious or the unconscious, the electronic belt contains the records of unredeemed karma from all embodiments. At the eye of this vortex of untransmuted energy is the consciousness of the anti-self personified in the [[dweller-on-the-threshold]], which must be slain before one can attain full [[Christhood]]. The master can better help us if we give his mantra, “I AM Light.” This mantra is for the development of a tremendous momentum of white light and the wisdom of God. It is to bring us to the realization that God can and does dwell within us. When we draw nigh to him, he draws nigh to us, and the angelic hosts also gather for the strengthening of the aura. In his book ''Studies of the Human Aura'', Kuthumi speaks of a threefold exercise using the “I AM Light” mantra that students can give for the purpose of strengthening the sheath of the aura so that they can maintain the consciousness of Christ, of God, of Buddha, of Mother. : Radiating light, intensified light. :: Radiating light, intensified light. : Transmuting it into light. :: Transmuting it into light. : This day I AM a focus of the Central Sun. :: This day I AM a focus of the Central Sun. : By human thought and feeling. :: By human thought and feeling. : I AM an outpost of the Divine. :: I AM an outpost of the Divine. : By the mighty river of light which I AM. :: By the mighty river of light which I AM. : I live, I live, I live in light. :: I live, I live, I live in light. : I AM light’s purest intention. :: I AM light’s purest intention. : The purpose of the kingdom of heaven. :: The purpose of the kingdom of heaven. From the focus of his etheric retreat at Shigatse, Tibet, Kuthumi plays celestial music on his organ to those who are making the [[transition]] called “death” from the physical plane to higher octaves. So tremendous is the cosmic radiation that pours through that organ—because it is keyed to the music of the spheres and an organ-focus in the [[City Foursquare]]—that souls are drawn out of the astral plane as if following a pied piper.